Toto and Muchkin are guinea pigs who were rescued by handler Patti Anderson and have really thrived with her thanks to a consistent, caring environment. According to Patti, Munchkin will purr like a cat when you pet her, and Toto is loved for being so gentle and sweet. Guinea pigs as therapy animals aren’t as common, so these two always get extra special attention when visiting. Patti visits with Toto and Munchkin as a North Star Therapy Animals team at University of Minnesota Masonic Children’s Hospital in Minneapolis. The team also works with at risk teens and participates in various children’s programs at schools. Children are also able to read to Toto and Munchkin through the Reading Education Assistance Dogs (R.E.A.D.) program at local libraries. 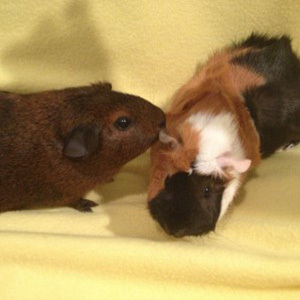 These guinea pigs have plenty of personality and love running through tunnels and chasing each other. Their favorite movie is “The Wizard of Oz” – naturally, and nothing is better than watching a movie with your favorite snack – and for this pair that happens to be cilantro!